One of the most challenging and enjoyable events I have ever participated in was the Virginia Challenge Triathlon. It usually falls in the middle of September. This event is performed on the New River Trail beginning in Fries, Virginia and ending in a beautiful state park called Foster Falls. It consists of 40 miles of biking, 12 miles of solo canoeing, no kayaks allowed, and the canoes have to be at least 14 feet long. The final event is a half marathon which consists of 13.1 miles on the trail from Allisonia back to Foster Falls to the finish. You have a choice of doing it as a team of three or as an individual. I chose to do it all as an individual. Most triathlons consist of running, biking, and swimming. I welcomed the new addition of adventure triathlons because they replace swimming with canoeing or kayaking. The running and biking event is usually performed on trails verses pavement. The canoeing and kayaking can be in rivers or lakes. I have done both. There are mini or sprint triathlons which are shorter in distance. I have done those also, but as I said this is my most memorable triathlon for many reasons. I found out about this triathlon while taking my children biking on the New River trail in Galax. This is where I am originally from, and I love taking my children there and sharing the beauty of the Blue Ridge Mountains. I left the area at seventeen and have always longed to return to the mountains. I am a true mountain woman, and the old adage “you can take the girl out of the mountains, but you can’t take the mountains out of the girl” is true. I loved any excuse to load up canoes and bikes and head for the hills. Most of my family still lives there which is added delight. My Mother is a wonderful hostess and serves up big pans of homemade biscuits with gravy, farm eggs, homemade jellies and jams, country ham, bacon, or sausage and thats just breakfast! I only had about two months to train for this triathlon. I had been doing little biking, no longer than 7.5 mile runs, and had not canoed since the summer before. I began an intense training regimen starting the following week. I drug out my canoe and the next weekend tried to paddle the twelve miles solo. I was in tears by the end of the 12 miles. I didn’t know to turn the canoe around sitting more centrally located, and to place some weight in the front to better control the front of the canoe. I had never solo canoed. A very kind, local gentleman who ran a campground and outfitter store with rentals in Austinville spotted me as he was running a shuttle. He approached me and ask if I was training for the challenge. He too was planning to do it as a team member doing the canoeing. This was not his first rodeo I quickly realized. He graciously offered for me to join him the following weekend as he would be taking others to show them the best way down this stretch of the river. He was a tremendous help throughout the rest of my training. The biking was enjoyable, but I was exhausted after the first ride of 40 miles. The good thing is there are no hilly areas, only slight elevations. The ride is beautiful! You ride along New River, cross bridges, go through tunnels, and see incredible beauty everywhere. I did not attempt the run. I kept training on Uwharrie trails which are much harder than the New River Trail. The New River Trail replaced train tracks after the rails being taken up, so it was easy running or biking. During the week I would try to get in a 7.5 mile run and a 25 mile bike ride. 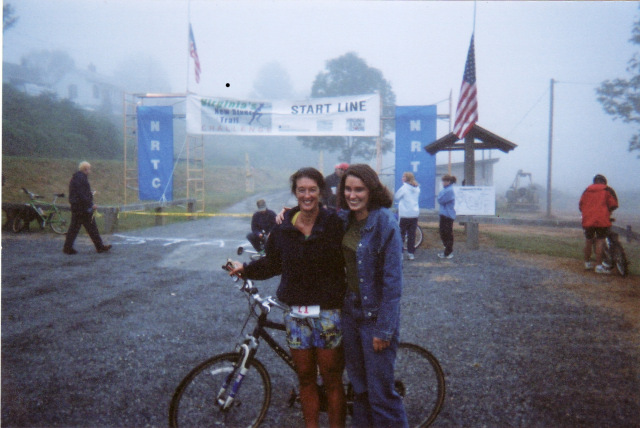 I would head for Va. each weekend and do 2 of the legs of the triathlon. 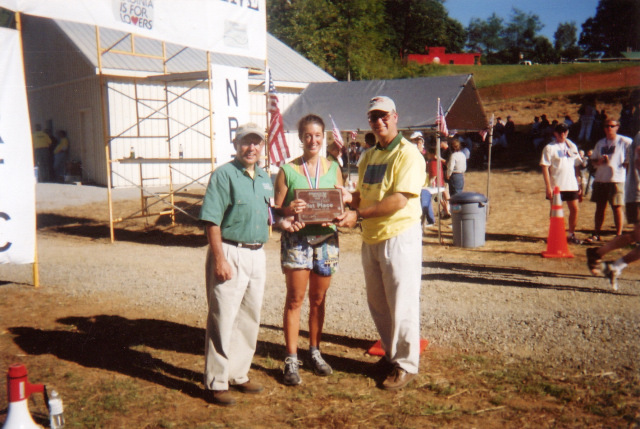 I always did the 12 miles in the canoe and would alternate the 40 mile bike ride with the 13.1 mile run. I never put all 3 together. My daughter, Sarah Beth, would kayak with me on the river and shuttle me back and forth from locations. She was great moral support, and I couldn’t have done it without her. I could write you a book on the experiences we shared, but will save that for another day. The day of the triathlon came only too soon. It was a cool morning as all the athletes prepared for the first leg which was the 40 mile bike ride. We left from Fries, biked to Galax, turned around and headed for Foster Falls. I gave no thought to what lay ahead as a whole. I only focused on the present 40 miles and biked as hard as I could pedal. I finished well, quickly used the potty, and jumped in my canoe at Foster Falls. Then thus began the long twelve miles down the river to the boat ramp in Allisonia. The water was low which made it an extremely difficult journey. Again, I only focused on the 12 miles and finishing. My legs locked up, and my lower back was aching. I kept paddling and prayed. My shoulders began to ache I saw a lot of folks turning over in their canoes. That surprised me and made me cautious and prayerful. By this time I had gotten past the class two rapids and I hit a still part of the river which meant more work. When I thought I couldn’t paddle another stroke, the wind picked up!! I could see the boat ramp in the distance but was unable to get to it due to the wind. All my efforts were going into trying to keep that long canoe on a straight course. It was exhausting and frustrating knowing I was losing time. I finally made it to the boat ramp at Allisonia that I had began to think was a mirage! My Mom and daughter, who was waiting for me to come in, said the man finally approaching the boat ramp just before me dropped his paddle as they pulled him in, and he literally cried! Yes, it was tough. I again refused to remember what had just happened and only focused on the 13.1 miles I had to run to complete this challenge. As I ran from the canoe, changed into running shoes, and began the run, my legs were extremely stiff from the bike ride and sitting cramped in the canoe for the last couple of hours. I did loosen up to some extent after the first several miles, and then I just hurt. I hurt because I was tired. My legs were aching from the long bike ride in which I had previously given my all and held back nothing. I have never done well at trying to temper myself. I only know one way; all the way or nothing! Approaching the last five miles of the run, Sarah, my daughter met me on the bike and rode in that last five with me. I finally crossed the finish line from a running pace reduced to a shuffle. I finished!! What a great sense of accomplishment! I might mention I had been in a wheel chair one year before. A horse had reared up and fallen backwards on top of me. I had suffered a crushed pelvis, and all the ligaments were torn from the spine. My vital signs were lost several times on the way to the hospital. I left in a wheel chair not knowing if I would walk again. I was told if I did I would have a severe limp. I serve a great God! I not only finished the triathlon, I was 4th woman overall and won 1st in my age group!! Sharing this story is a tribute to the great God I serve and I know many of you do also. We can do all things through Christ. I am a living testament to trusting God and stepping out in faith. He proves Himself faithful if we will only believe and give Him the chance. I hope this is an encouragement to someone who may need to overcome and defeat the odds. We truly can be more than conquerors through Christ. NextMasterpiece Fitness Answers… How Do We Achieve “Life”?